Why can't I take a slice from an array? 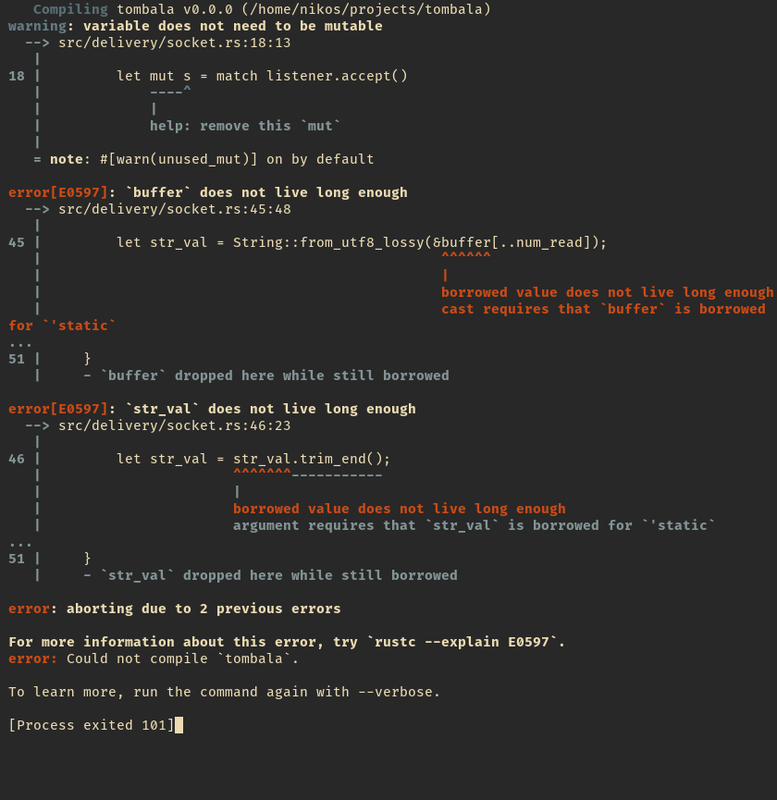 the code below won’t compile because of the part &buffer[..num_read] the compiler complains that it does not live long enough. Then how do I slice the array if it never lives long enough? From rust book what I understand 'static lifetimed things are never getting cleaned up so using 'static lifetime for the buffer is not an option I assume. Lifetimes don’t do what you think they do. They just annotate code for the compiler’s understanding of programmer-intent; a lifetime will not extend the life of the annotated item. The lifetime annotations only provide relationships between references. Here is a useful error reference page for things like this. Particularly, this provides some contextual information for the error, as well as the same “create a temporary binding” solution. If I comment out the use of the reference-to-nothing with the one-liner (comment out the println!) then the code compiles (thanks to NLL) but of course it really doesn’t do anything useful. unfortunately thid does not work for me can this be a compiler bug where identical code refuses to compile for me ? I think this is going to come down to your definition of the Command struct, which seems to have a 'static lifetime bound? It’s hard to say without seeing the full code, so this is just a guess.